Quite the opposite attitude toward lefties in thirteenth century BC! The Bible mentions an elite corps of warriors: “There were 700 choice men who were left-handed among all these people; all could sling a stone at a hair and not miss” (Judges 20:16 HCSB). 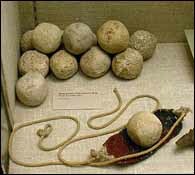 A slingstone weighing a pound could be propelled up to a hundred miles an hour and hit the target a quarter of a mile or more away. Do you think anyone gave a moment’s thought to changing their left-handed defenders? The ancient sharpshooters were accepted (and useful) just as they were. There is a birthed minority that is so rare it can’t even claim 1 percent of the world population. In fact, you could count them on both hands and feet with some toes left over. Does that make this minuscule segment of society inconsequential? 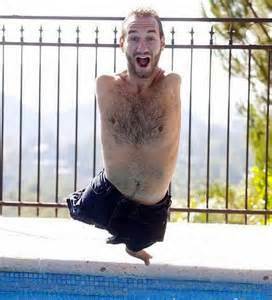 Three-foot-three Nick Vujicic proves not. This entry was tagged Anxiety, Attitude, Coping, Depression, Hope, Human value, Importance of one life, Judges 20, left-handed, Limit, Limits, Minority, Nick Vujicic, Perspective, Psalm 139, relationships, Self-esteem, self-worth, Stamina, tetra-amelia, Value. Bookmark the permalink.